The tide I’m talking about is the globalization of the wine market and I frequently hear that its ebb and flow bring in the main international wine grape varieties and the styles associated with them and wash out unique local wines. There is a grain of truth to this — one winemaker explained it to me this way. If I make poor but distinctive local wine and can’t sell it, I can blame international market forces (and not my own lax wine making) and just plant Merlot. Classic cop-out, he said. And of course the demographic of wine consumption is changing, too (the who, what, where, when, how and why) with more new consumers who face a steep learning curve that sometimes works against wines that lie outside the mainstream. There are lots of pressures on winemakers today and globalization is certainly one of them. But I’m not sure that the premise of the argument is correct. Although the wine market is much more global than in the past, it is still surprisingly local compared to many other industries, with most production sold in the country of origin. And although it is easy to spot increasing consolidation within the wine industry, it remains remarkably fragmented compared to most other international businesses. And, to keep the momentum going, while it is easy to look at the wine wall and see acres of Cab and Chardonnay (and other “international” varieties) from all around the world, it is just as easy to note how very many distinctly local varieties are present. It is sort of a macro-micro thing. If you look at the wine industry in terms of Rabobank’s very cool map (above) of international wine trade, it is easy to see the world defined by those big international flows, but if you look at it in terms of DeLong’s even cooler Wine Map of Italy (below), for example, the persistence of local wine markets becomes clear. We explored this global-local tension during our recent trip to Italy to attend the meetings of the American Association of Wine Economists in Bolzano. Italy is far and away the world’s largest wine exporting nation according to Global Wine Markets Statistical Compendium data, with average exports of 1,861 million liters during 2007-2009 period. France and Spain are second the third with 1,379 million liters and 1,292 million liters respectively. Australia is a distant fourth in the data set with an average of 782 million liters for the two year time period. So, if the global tide argument holds, you would expect Italy to be covered like a layer of paint with endless hectares of international variety wine grapes. And, of course, there is a lot of Merlot, Cabernet and Chardonnay to be found in Italy along with other international standard varieties like Sauvignon, Riesling and Pinot Noir. But what stands out when you think about Italian wine is the success of indigenous wine varieties and styles. Italy makes and sells international varieties, but the indigenous wines are what define it as a wine country. Sometimes this success is driven by export markets (think about the popularity of Chianti and Sangiovese) but there are many successes that are really quite local in scope and stand as delicious counterexamples to the the incoming global tide theory. Let me give you three examples from our Italian fieldwork (Pignoletto, Lacrima di Morro and Ruché) saving a fourth case study (Kerner) for a more detailed treatment in my next post. 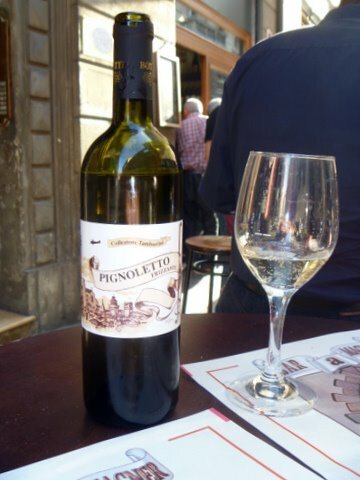 Pignoletto is a dry white wine grown only in the hills outside of Bologna. “Lively, crisp, aromatic” is how Jancis Robinson describes it in her Guide to Wine Grapes. Pignoletto is distinctly Bolognese — grown there, made there and I think that every last drop of it is consumed there, too, since it goes so well with the rich local cuisine (almost as if they evolved together … which I guess they did). It would be hard to beat the simple meal of salumi, cheese and bread that we had with a bottle of Pignoletto frizzante at Tamburini‘s wine bar in the Bologna central market. Lacrima di Morro d’Alba is a distinctive red wine from the Marche region. Robinson describes is as “fast maturing, strangely scented.” Burton Anderson says that it is a “purple-crimson wine with … foxy berry-like odor and ripe plum flavor.” Apparently it fades very quickly, but it is distinctive and intense while it lasts. It sure stood up to the very rich cuisine of Ferrara when we visited our friends in that city. We were fortunate that the restaurant owner guided us to this wine from the Mario Luchetti estate. Ruché comes from the Piedmont and we stumbled upon it by accident (which I guess is how we usually stumble …). 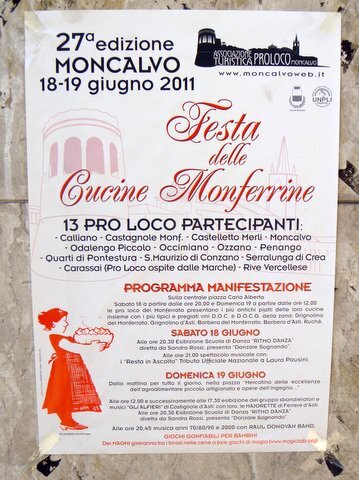 We were attending the annual regional culinary fair in Moncalvo, a hill town half an hour north of Asti. Thirteen “pro loco” civic groups from throughout the region set up food and wine booths in the central square and sold their distinctly local wares to a hungry luncheon crowd. 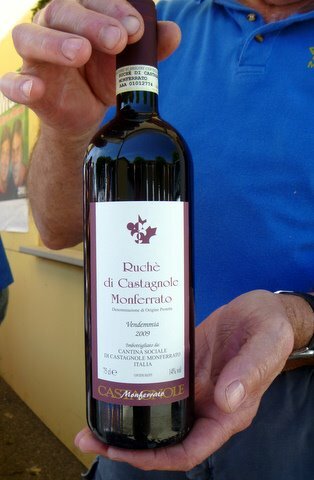 I had never heard of Ruché and honestly didn’t know what it might be until I happened upon the stand of the Castagnole Monferrato group. They were cooking with Ruché, marinating fruit in Ruché and selling it by the glass — they were obviously very proud of their local wine. I had to try it and it was great. Suddenly I saw Ruché everywhere (a common experience with a new discovery) and enjoyed a bottle at dinner in Asti that night. “Like Nebbiolo,” Jancis Robinson writes, “the wine is headily scented and its tannins imbue it with an almost bitter aftertaste.” An interesting wine and a memorable discovery. I think we all have these great “ah ha!” wine experiences when we travel so why am I making such a big deal about these three wines? Well, that’s the point really. Distinct, truly local wines are commonplace in Italy. What is in some ways the most global wine country is also perhaps the most local. Global and local exist side by side and if they don’t entirely support each other all the time, they aren’t necessarily constant, bitter enemies, either. The key, I think, is local support of local wines and wine makers. That’s why these three wines have survived and sustained themselves. I don’t think “me too” wines are capable of gathering local support. Why does this come as such a surprise to us in the United States — why do we so easily swallow the idea of the unstoppable global tide. It is, I suppose, a legacy of prohibition, which destroyed many local wine cultures in the U.S. Wine today continues the difficult task of recovering from prohibition’s long lasting effects. Are There Really Local American Wines? So are there American wines that are local in the same sense of Pignoletto and Ruché? Sue asked that question as we drove out of the Asti Hills and headed north. I don’t know, I replied. Maybe. Petite Sirah is kind of a California cult wine, but it isn’t local in the same way as these Italian wines. Here in Washington State we seem to have a thing for Lemberger, which sells out in the tasting rooms of the wineries that make it and seldom shows up outside the region. It’s an Austrian grape, but it has made its home here. Can you think of any other wines like this? Please leave a comment if you have a suggestion! Perhaps we buy the global tide argument because it is so foreign to us? I think it would be interesting if we imported more than Italy’s wines — perhaps we could share their idea of really local wine, too. While I personally support the Buy Local movement and support the great diversity of varietals beyond the big five I worked for an Italian wine importer who drilled into me on buying trips the most important question to ask and answer was “Can we sell a container full of this wine?”. He is a proud Italian from Campania and we were always being pitched aglianico, cannonau, pinot nero, etc. The importer believed after 45 years of importing experience that Americans in particular would not buy wines they were ubfamiliar with or could not pronounce. Now that may be his narrow opinion but he does have 45 years of sales figures to back it up. I hope to be able to broaden his view. Globalization also provides us with opportunities to extend our reach and try new wines that were never available before. I agree. Globalization creates opportunities but also erects some barriers to local wines. Thanks for your comment! The problem in the Northwest, or in America in general, is very little wine really tastes like it came from ‘somewhere’. There is very little sense of place in the wines because the same varietals are planted everywhere, and the ‘new world’ style is much higher in alcohol, extraction and flavor that it covers up the ‘place’. I’ve had many a winemaker tell me that grapes like Cabernet are much easier to make great wine with, you can get all the flavor and extraction you want and add as much oak as you like to help cover some things up. While some grapes (Sangiovese, Trebbiano) are grown in many different parts of Italy, most are not. Aglianico, Nebbiolo, Gaglioppo, Roscetto reflect where they are from because that is the only place you can find them! Plus, as you mentioned, the food and wine essentially grew up together, the wine goes with the food because it always has. There is no wine pairing, you eat and drink where you are. There is a lot of good wine up here in the PNW, but since we have no real food history (unless you count living on Salmon and berries etc), the wine has never had a type of food that it ‘has’ to go with. Since I work for an Italian importer, I’m glad that people up here are very willing to try new grapes and styles. Sure, it’s a little harder to sell, but I think the reward is greater. Exposing people to new flavors and such is like exposing them to a new part of the world. Mike – well, how ’bout we start with Norton whether from Missouri (it’s the official state grape) or Virginia (its original home)? Norton is a great suggestion. Thanks! Would it be out of bounds to argue that Washington Merlot is a thing in itself, arguably different and therefore applicable as well? I think it’s a reasonable argument, but a reasonable person could disagree. Does that make sense to you, Mike? That’s a tough one, Doug. I attended a seminar where several top Washington winemakers tried (without much success) to define Washington’s distinctive style. Maybe they would have had more luck if they focused on Merlot? Awesome post as usual. I’d love to get high resolution versions of the Rabo-maps. Also, I went to go buy that cool Italy map you linked to. You’ll have to contact the bank research dept if you need something even bigger. The maps a couple of years old and so not precise about today’s markets, but still very useful. Great article…I’d recommend checking out Vidal Blanc…a hybrid but one that has actually made an impact in the wine market place (though mostly from producers north of the border). A wonderful post, from a viewpoint that makes your blog unique, Mike. You obviously get off the beaten path in your travels. That sounds like a great trip, Ken! “…are there American wines that are local in the same sense of Pignoletto and Ruché?” I’d say yes, although a bit more tenuously. Zinfandel in California has fairly distinct local styles (think Dry Creek vs. Lodi vs. Amador vs. Paso) – they can be made to taste similar, but the combination of terroir/climate and local preferences and assumptions about winemaking often ensure they don’t. Missouri is preserving a local wine style and culture, in particular with the above-mentioned Norton and Vignoles. Finger Lakes Riesling and the austere, intense whites of Leelanau and Old Mission regions in Michigan may be other examples. Walla Walla Syrah? One thing the marketing advocates of international varieties often forget is supply and competition. Yes, the demand for Chard/Cab/Merlot is larger, but so is the supply side. If you bottle your Macon as Chardonnay, you added all those Chardonnay drinkers as potential customers, but also just added all those Chardonnay SKUs as substitutes. Here in Ohio, some wines that could represent the region are Vidal Blanc, Seyval, DeChaunac, Cabernet Franc, Traminette, and Chambourcin that have all done well in this region and are pleasant enough when handled by a winemaker that can make them come alive. Popular Ohio grown varieties across the state have been Catawba, grown here since the 1800’s, Concord grown almost everywhere and lots of blends of varieties not discussed in most circles, but grow well here. There are also Ohio vineyards with the more well known vitis vinifera grapes now better adapted to our soil and climate, but there are so many good Cabernet Sauvignons, Syrahs, Chardonnays, Merlots,etc from other countries at great prices, I don’t see any advantage for them to be grown here with only a few estate grown exceptions. I believe Ohio wines have not found their rallying point yet, but many are made fruit forward in a more European way and some just downright sweet because many owners say that’s what sells most and it’s relatively inexpensive to make. The US has a long way to go for the whole country to be like an Italy or a Spain or even a France where location is just as important as varietal. They didn’t have prohibition where the federal government literally tore out and destroyed vines. The US wine industry has really only been building with any substance since the 1960’s. Only California “beat” the French wines. There’s 49 states to go! Yes, I think there are numerous grape varieties that have developed/are developing local reputations. The hardy white wine varieties Edelweiss, LaCrescent and Brianna(Iowa, Nebraska and upper New England), Frontenac & Frontenac Gris(northern tier of states, and even the Hudson River Valley), Delaware & Diamond(Finger Lakes), Niagara(Lake Erie grape belt), Seyval(upper Midwest & Finger Lakes), St. Croix(Connecticut) are some examples. All can make very tasty wines when grown & vinted properly. It’s an especially exciting time to be a wine drinker in the North & Northeast. I don’t know if you can say there are truly local American wines altho I agree there is something very distinctive about a Dry Creek Zin or a Russian River PInot Noir. I do know tho that here in the San Francisco Bay Area people are starting to fully explore and appreciate regional Italian wines. A good thing since that is what we have built our business around: importing small-production wines traditionally made from indigenous Italian grapes. The response has been slow but steady. Often people outside the industry ask if our wines are “like a Chardonnay” or “like a Pinot Noir.” This is how all too many Americans approach a wine, as if there are really only 5 or 6 wine grapes in the entire world! Therein lies our first hurdle. Thanks for a good, insightful article. . Thank you for your most enjoyable article. Are there American wines that are local in the same sense of Pignoletto and Ruché?” I find that Virginia has a unique handle on Petit Verdot and Viognier as Missouri manages Norton and Chardonel wines. What makes the American Norton unique is how the 246 Norton wineries in 23 states approach this rather hard to venify grape. Even in Missouri’s 82 Norton wineries you can find distinct taste differences in this perfumed structured wine if produced in the areas just west of St. Louis and those coming from the Southeast area of St. Genevieve. Rather than wineries which attempt to copy European styles, it is a pleasure to find local vineyards striking out for their own taste niches.